Scorpion venom contains insect and mammal selective toxins. We investigated the venom of the South Indian red scorpion, Mesobuthus tamulus for the purpose of identifying potent insecticidal peptide toxins. A lepidopteran-selective toxin (Buthus tamulus insect toxin; ButaIT) has been isolated from this venom. The primary structure analysis reveals that it is a single polypeptide composed of 37 amino acids cross-linked by four disulfide bridges with high sequence homology to other short toxins such as Peptide I, neurotoxin P2, Lqh-8/6, chlorotoxin, insectotoxin I5A, insect toxin 15 and insectotoxin I1. 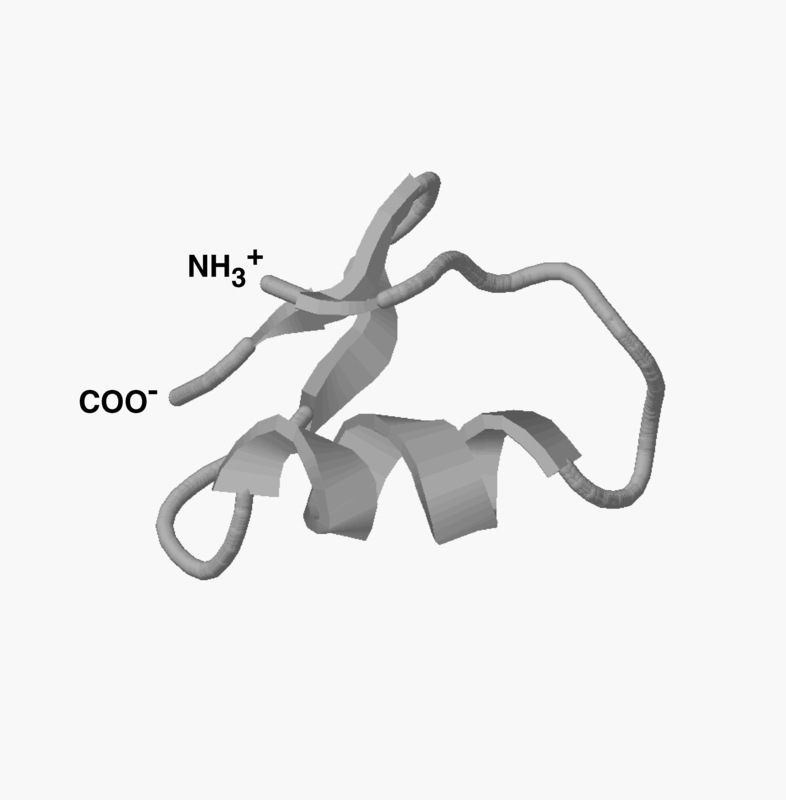 Three dimensional modeling using Swiss automated protein modeling server reveals that this toxin contains a short α-helix and three antiparallel β-strands, similar to other short scorpion toxins. This toxin is selectively active on Heliothis virescens causing flaccid paralysis but was non-toxic to blowfly larvae and mice. This is the first report of a Heliothine selective peptide toxin. Identification of diverse insect selective toxins offer advantages in employing these peptides selectively for pest control. Scorpion venom is a rich source of various polypeptides with diverse physiological and pharmacological activities which generally exert their action via target specific modulation of ion channel function [1–3]. Among the well characterized peptide toxins are those from the venom of scorpions belonging to the family Buthidae. Buthoid venom has been reported to strongly affect a wide variety of vertebrate and invertebrate organisms  and its toxicity is attributed to the presence of a large variety of basic polypeptides cross-linked by 3–4 disulfide bridges[1, 4]. Based on their molecular size and pharmacological activity, these toxins are classified into two main groups. The first group contains short toxins (30–40 amino acid residues) with 3–4 disulfide bridges which mainly affect the voltage dependent K+ channels and the large conductance calcium activated K+ channels [5, 6]. The second group includes long-chain (60–70 amino acids) peptides cross linked by 4 disulfide bridges which mainly have an effect on voltage dependent sodium channels of excitable cells [1, 2]. According to their species selectivity sodium channel toxins have been divided into mammalian and insect toxins. Furthermore, depending on their binding affinities and electrophysiological properties, the mammalian toxins are sub-classified into α- and β- toxins [7, 8], and the insect-specific toxins are subdivided into excitatory, depressant and α- insect toxins . Several toxins which specifically affect sodium and potassium channels have been extensively studied with respect to their structure, mode of action and pharmacological properties [4, 6, 10]. In addition to the two main groups of toxins, several other toxins targeted toward Ca2+ and Cl- channels have also been isolated during the past decade. Owing to their species selectivity, increasing attention has been paid in recent years to identify insect-selective toxins that can be used to develop recombinant biopesticides as a safer alternative to broad spectrum chemical insecticides [12–14]. Several insect-selective toxins have been identified and purified from scorpions collected in different geographical locations [2, 11, 15–18]. However, the Indian red scorpion, Mesobuthus tamulus, known for its severe toxicity [19, 20] received little attention in this regard. The few studies documented on Buthus tamulus are restricted to the isolation and purification of neurotoxins, protease inhibitors, histamine releasers  iberiotoxin, an inhibitor of high conductance Ca2+-activated K+ channel  and neurotoxin Bt-II . In the quest for natural insect-selective toxins, we have identified a novel short lepidopteran-selective toxin from the venom of Mesobuthus tamulus having 37 amino acids residues and 8 half-cystines. We named it as ButaIT (B. tamulus insect toxin) which has high sequence homology with a few short toxins [11, 22–27] and shows high selectivity to a lepidopteran insect, Heliothis virescens. This paper describes isolation, purification, and sequence determination of this toxin. The CM-52 cation exchange column yielded 7 peaks at 280 nm (Fig-1). When CM fractions were tested for lethality on mice, only CM-fraction III and crude venom were found to be toxic at a dose of 3 μg/g body weight. Among all the CM fractions, CM fraction IV accounted for almost all of the lethality to tobacco budworm. Hence further studies were conducted using only CM fraction IV. Fractionation of CM-IV yielded 14 peaks using ion-pair reversed phase HPLC (Fig. 2). Bioassay of the individual HPLC fractions of CM-IV fraction on tobacco budworm, blowfly larvae and mice led to the localization of lepidopteran selective toxicity in CM-IV fraction 6 (Table 1). Administration of CM-IV HPLC fractions to tobacco budworm at a dose of 1 μg/100 mg larva showed slow and progressive flaccid paralysis only with fraction 6. Other fractions were ineffective at this dose. 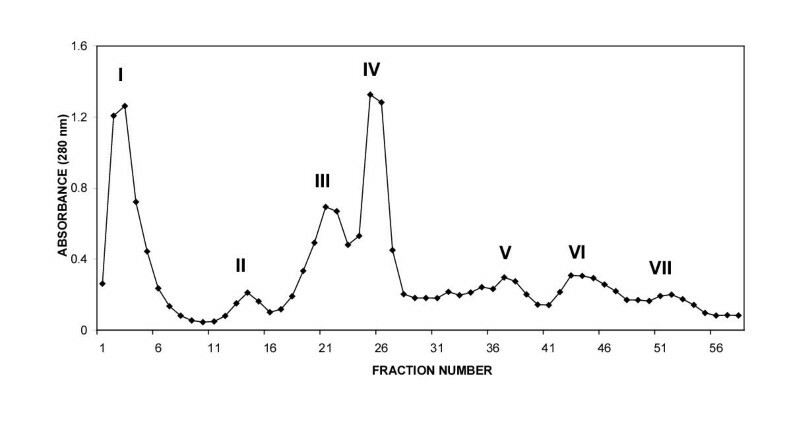 Hence, fraction 6 (CM-IV-6) was collected, lyophilized and resolved further using HPLC gradient system-II which yielded two peaks: CM-IV-6A and CM-IV-6B. Among the two, fraction CM-IV-6A was found to induce progressive, irreversible flaccid paralysis at the dose of 1 μg/100 mg per larva of Heliothis virescens. Neither of these fractions induced any significant toxic symptoms in blowfly larvae or mice. This fraction was further purified to apparent homogeneity by microbore HPLC and the purity was confirmed by capillary electrophoresis (Fig. 3). This fraction is estimated to account for 0.026% of the total protein content of the dry venom. CM-52 ion exchange fractionation of peptide toxins from the venom of Mesobuthus tamulus. HPLC fractionation of CM-IV ion exchange fraction using reverse phase C4 column. The Peak 6 was identified as an insect selective toxin exclusively active on Heliothis virescens. Purity of ButaIT was confirmed using free-solution capillary electrophoresis. ButaIT (0.2 mg/ml) was loaded onto a column, equilibrated in 20 mM sodium citrate, pH 2.9. The sample was eluted from the capillary using an electric potential of 20 kV and the absorbance was monitored at 214 nm. Toxicity of fractions from HPLC purification of peak of CM-IV against blowfly, tobacco budworm larvae and mice. All other fractions were found to have no toxicity in the above insect bioassays. The toxicity against mice was not determined for other HPLC fractions. At least 6 animals of each species were assayed with each fraction. + indicates 100% mortality. - indicates zero mortality a. 1 μg/100 mg larvae was injected b. 3 μg/g body weight was injected. The molecular mass of the peptide toxin determined by ESI-MS was 3856.7Da (Fig. 4) which is in agreement with the molecular mass calculated from the amino acid sequence when the toxin is in its native form with four disulfide bridges as observed in other similar toxins. An examination of multiple sequence alignment with known insect toxins using BLAST search  revealed that ButaIT toxin shows considerable homology (Fig. 5) with short insect toxins, and shows highest percentage identity with peptide I (68%) and LQH-8/6 (68%) followed by neurotoxin P2 (66%), chlorotoxin (64%), insectotoxin I5A (60%), insect toxin I5 (60%) and insectotoxin II (52%) [11, 22–27]. The determination of molecular mass of Buta IT. The maximum entropy deconvolution algorithm (MaxEnt) was used to transform the range m/z 650–1500 on a VG/Fisions Quattro mass spectrophotometer to give a true mass scale spectrum. Sequence alignment of Buta IT with those of other short toxins characterized by four disulfide bridges, using Clustal W software. Gaps have been introduced to give maximum sequence identity. Toxins of buthid venoms constitute a family of closely related peptides which could be classified into several structurally related peptides depending on their amino acid . Although the information available on the mode of action of these toxins is limited, it appears that different short toxins exhibit considerable diversity in their physiological mechanisms in spite of their structural homology. For example Fazal et al.,  reported that peptide I is related to neurophysin, agglutinins [29, 30] and other peptides of the four-disulfide core family with toxin/agglutinin fold. The neurotoxin P2 (35 ammo acids), another short toxin and a structural homologue of short insectotoxin II and 15, shows toxicity towards Sarcophaga falculata and crustaceans . Chlorotoxin, isolated from Leiurus quinquestriatus haebraeus, shows Cl- channel-blocking activity and causes paralysis due to the inhibition of structurally related anion channels such as the extrajunctional channels of arthropod muscles . It has also been reported that the short insectotoxin I5A may act on a "glutamate receptor of the postsynaptic membrane" . Although no specific experimental evidence is available on the mode of action of ButaIT, it is assumed that ButaIT exerts similar ion channel blocking activity as that of other short insect toxins. However a detailed physiological and pharmacological analysis is necessary to define the exact mechanism of ButaIT in spite of its high sequence and structural homology with other insect toxins. Considering the high degree of sequence similarity, it is presumed that ButaIT will have a similar 3-D structure to that of other short toxins. The 3-D structures of several short toxins such as charybdotoxin (ChTX) , iberiotoxin (IbTx) , kaliotoxin (KxTx) [32, 33] margatoxin (MgTx) , maurotoxin , agitoxin (AgTx) , noxiustoxin (NTX) , PiL , insectotoxin I5A , LQH-8/6  and chlorotoxin  have been determined by NMR spectroscopy and X-ray crystallography. A structure model of ButaIT, generated from the Swiss-model protein modeling server based on the structural coordinates of chlorotoxin  and insectotoxin I5A  showed that ButaIT adopts a typical core structure of scorpion toxins primarily composed of one α-helix and three β-strands with four disulfide bridges, a feature similar to other toxins of similar size that act on K+ and Cl - channels [17, 31, 34, 38]. It is also evident from the data that disulfide bridge formation in ButaIT likely follows a common motif, with covalent links between cysl6-cys32, cys5-cys27, cys20-cys34 and an additional disulfide bridge between cys2 and cys 19 which cross-links the N-terminal strand of the β-sheet to the α-helix. Experiments are underway to purify larger quantities of ButaIT using baculovirus expression system in order to establish a refined structure/function relationship. Here we report the isolation of a short insecticidal toxin from the venom of Mesobuthus tamulus. The most important characteristic of this novel toxin is its specificity towards Heliothis virescens, the tobacco budworm, a worldwide pest of numerous valuable crops such as cotton. When expressed in baculovirus system as a biopesticide scorpion toxins offer the advantage of faster kill without chemical insecticides . Although the safety of recombinant baculoviruses is less of a concern ButaIT offers an extra level of safety as a recombinant biopesticide due to its specificity to tobacco budworm ion channels. Moreover this toxin can be utilized as a specific probe of tobacco budworm ion channels. Chemical libraries can be screened for the ability to displace ButaIT leading to the discovery of better pesticides. The crude venom of Mesobuthus tamulus was purchased from Haffkine Institute (Bombay, India). Lyophilized venom (50 mg) was homogenized in 2 ml of 10 mM ammonium acetate (pH 6.4) using Potter-Elvehjam homogenizer and the insoluble material was removed by centrifugation at 15,000 rpm for 20 min. An additional 1 ml of ammonium acetate was added to the pellet, the homogenization was repeated, the contents were centrifuged and the supernatant was collected. The above procedure was repeated 4 to 5 times to maximize the yield of peptide toxins from the crude venom. The supernatant fractions were pooled, passed through a pre-cycled CM-52 column and eluted with a gradient of 0.01 M to 0.5 M ammonium acetate (pH 6.4) at a flow rate of 3 ml/h using a Pharmacia peristaltic pump. Fractions (3 ml), were collected using a BioRad (Model 2110) fraction collector. All the chromatographic separations were carried out at 4°C. Individual fractions were monitored at 280 nm using a Shimadzu spectrophotometer (UV 2101 PC). The active fractions under the same absorbency peak were pooled and freeze dried. 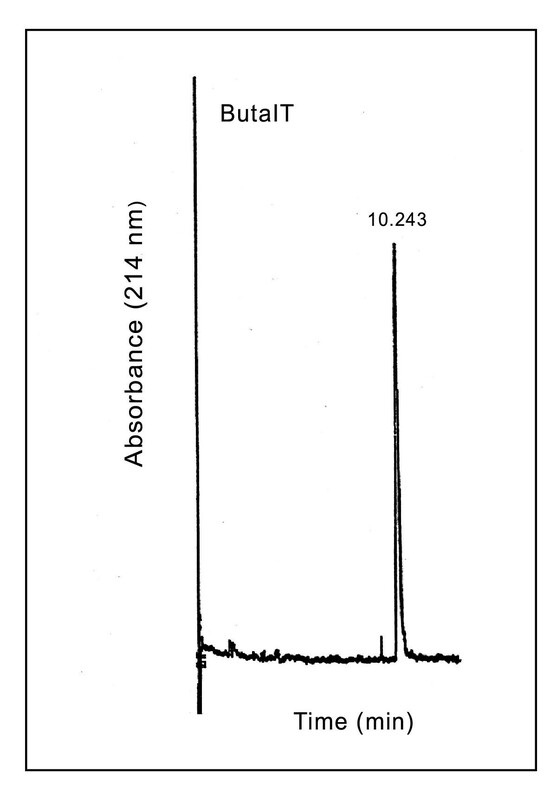 Chromatographic analysis of CM-fractions was done by HPLC (Perkin-Elmer Series 410 pump) which was equipped with a LC-235 diode array detector. The UV measurements were performed simultaneously at 215 and 280 nm. A 10 μm particle size Protein C4 column (25 cm × 4.5 mm ID; Vydac, Hesperia, CA, USA) was used in conjunction with a C4 guard column cartridge. The column was maintained at room temperature (25°C). Chromatographic peaks were integrated on an Everex 386/20 PC using Omega software and Perkin-Elmer GP-100 graphics integrator. The freeze dried CM-fractions were resuspended in water and aliquots of 1 mg each were loaded onto the C4 reversed phase column equilibrated in Solvent A (A= 5% acetonitrile, 0.1% trifluroacetic acid, TFA). The individual proteins were eluted from the column with a linear gradient reaching 60% Solvent B (B= 95% acetonitrile; 0.1% TFA) in 70 min at a flow rate of 0.6 ml/min. (Gradient system-I). All the fractions were collected, freeze dried and assayed for biological activity. 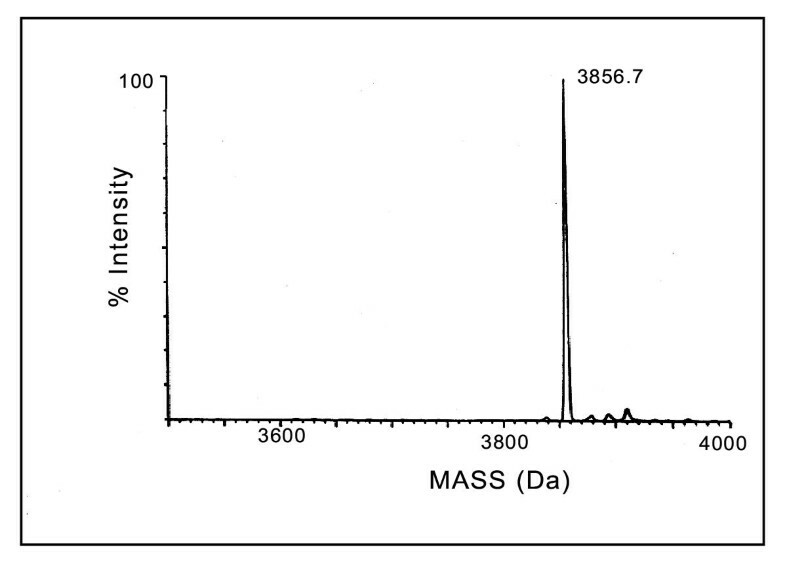 The active fractions were further purified using a Protein C4 Column (Vydac 25 cm × 4.6 mm ID) equilibrated with Solvent A (A= 5% acetonitrile; 0.1% heptafluorobutyric acid (HFBA) and resolution of peaks was accomplished using gradient elution of solvent B (B= 95% acetonitrile; 0.1% HFBA) reaching 60% in 70 min at a flow rate of 0.6 ml/min. (Gradient system-II). Individual peaks were collected, lyophilized and used for bioassays. The protein concentrations of the samples were determined using the BCA protein assay (Pierce) with bovine serum albumin as the standard. 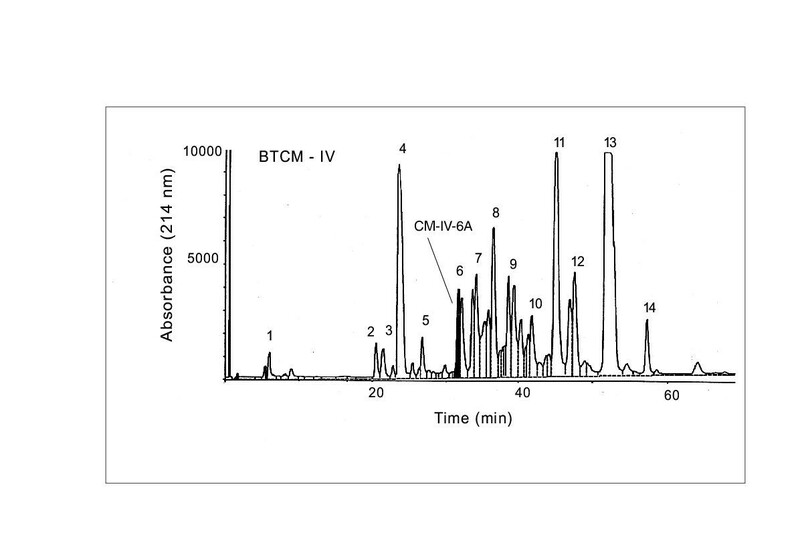 Following two HPLC steps, the toxins were further purified using a Reliasil C18 reversed-phase column (Michrom 10 cm × 1 mm ID)on a Microbore HPLC system (Michrom Bioresources Inc., USA). The insect-selective toxin was loaded onto the C18 column and eluted in a linear gradient of 10–60 % Solvent B (95% acetonitrile; 0.1% TFA) over 60 min at a flow rate of 100 μl/min. The purity of the toxins was evaluated by free solution capillary electrophoresis on an Applied Biosystems capillary electrophoresis Model 270A. The 75 cm capillary was equilibrated for 4 minutes with 20 mM sodium citrate buffer (pH 2.9) and the toxin (0.2 mg/ml) was loaded using vacuum for 2 seconds. Resolution of peaks were performed using 20 mM sodium citrate buffer (pH 2.9) at 20 kV electric potential and the absorbance was monitored at 215 nm. The individual lyophilized fractions were dissolved in deionized water, and an appropriate concentration of each fraction was injected into fourth instar Heliothis virescens (tobacco budworm) and last instar larvae of Sarcophaga falculata (blowfly). The neurotoxic symptoms in the larvae were observed continuously for 30 minutes and also after 24 hr. post-injection. Complete immobility or paralysis was taken as an indication for the neurotoxic activity in insect larvae. Each fraction was also injected subcutaneously into mice in order to check for any mammalian toxicity. The three-dimensional structure of Buta IT derived by Swiss-Model Protein Modeling Server using the NMR coordinates of chlorotoxin and insecotoxin I5A. The RasMol program is used to visualize the 3-D structure of the molecule. The carbon backbone trace of the molecule displays a basic scaffold composed of an α-helix and three β-strands similar to other short toxins. The purified ButaIT was reduced and carboxymethylated by incubating in 6 M guanidine hydrochloride, 0.1 M Tris-HCl (pH 8.3), 1 mM EDTA and 20 mM dithiothreitol for 1 hr at 37°C. Iodoacetic acid was added to a final concentration of 50 mM and incubated for an additional hour at 37°C in the dark. The N-terminal sequence of the toxin was determined using HP GS1000 sequence analyzer by automated Edman degradation at the Molecular Structure Facility of UC Davis. The amino acid sequence of ButaIT was submitted to Swiss-Model Protein modeling server (Guex and Peitsch, 1997; Peitsch, 1995; Peitsch, 1996; Preitsch and Guex, 1997) and the three dimensional model structure was extracted as PDB file based on the NMR coordinates of apparently homologous scorpion toxins such as chlorotoxin (PDB entry : 1Chl.pdb) and insectotoxin I5A (PDB entry: 1SIS.pdb). Visualization of the 3D structure was performed using RasMol Molecular PDB visualization software. Note: The amino acid sequence of novel lepidopteran-selective toxin reported in this paper will appear in the SWISS-PROT protein data bank under the accession number P81761. W.R. gratefully acknowledges the financial support from the Rockefeller Foundation (grant #RF93022) in the form of Biotechnology Career Fellowship. B.I. is supported by Ankara University, Turkey. This research was supported in part by grants from the USDA (#97-35302-4406) and BARD (#IS-2530-95C). UC Davis is a NIEHS Health Science Center (#ES05707) and U.S. EPA center for Ecological Health Research (#CR819658). Mass spectral analysis was supported by NIEHS Superfund Basic Research Program (#ES04699).